Eggs can welcome you home, fuel your morning, or even make a light supper. 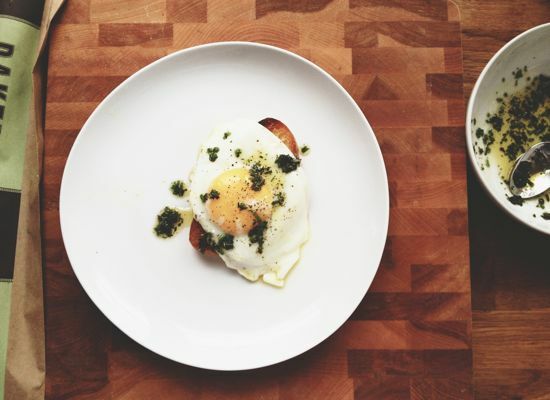 As an ingredient, eggs are incredibly versatile, and need little more than proper seasoning. I was glad to come across this poem when I did, because of the meal suggestions, "baked tilapia, omelet, tomato tart," the combination of eggs and herbs sounded especially appealing. the suppers ahead: baked tilapia, omelet, tomato tart. on the counter, the rest sweetens the brushpile. soon enough to revise the path taken. From Pudding Magazine 53 (Summer 2007). Reprinted with permission from the author. Her most recent poetry collections can be viewed here, and here. From the first line, word even, we are entangled with thyme. This is the trick plants play with us. They begin as mere seeds, innocent in our hands, then what was intended as a simple solution to "soften edges of flagstone and spice up my soup," turns to an assault, our lives "overrun." But once the plant is tamed, sheared back, divided between the kitchen and brushpile, the sheer abundance of it all has been accepted. I can't help but find a lesson in here. We encounter these experiences all the time. A decision we make, like giving advice to a friend, accepting or denying a job offer, or merely imagining our lives being different than the present moment, can change the trajectory of things, or surprise us. At first, what appears overwhelming and smothering, like thyme let loose in a garden, eventually offers abundance. Where we once had none, we now have choices: Chop some herbs for an omelet, add it to the brushpile, trim it back. Not every obstacle has to crush us. What matters is what we do with the opportunity. The end of December is the ideal time to embrace what may come, in the garden or in life. So have some eggs, read a poem, and I wish you all a wonderful new year! This is less of a recipe and more a series of suggestions. The ingredient amounts can be modified to your liking. Feel free to mix and match your herbs based on what you have available. Heat some oil in a saute pan over low heat. Add the eggs, one at a time, and season with salt and pepper. Cook for about five minutes, or until the eggs are cooked through and yolks are set. While the eggs cook, chop your herbs and stir with oil in a small bowl; season with salt and pepper. You want the herbs to be fairly thick, so they're not drowning in oil. Remove eggs with a spatula and place one on each piece of bread. Drizzle the herb oil over the top and serve.